In the winter months, you will regularly have to walk your dog at dusk or in the dark. Please ensure that both you and your dog are visible to other road users. You can do this by using a safety light, a luminous collar, a light up lead and/or reflective safety vest. You can find all of these products in our category safety on the road. Whether your dog needs a winter coat or dog raincoat depends on its coat type and where it lives. 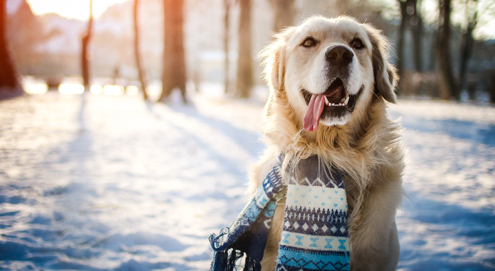 Dogs that normally live outdoors all year long will adjust their coat thickness to the cold weather conditions. This means they will not get cold easily. Dogs with a double coat, such as rough-haired dogs (German Wirehaired Pointer) or dogs with a long thick coat (Bernese Mountain Dog) will be warm enough thanks to their coat, and should not need a winter coat. Short-haired breeds and smaller dogs (Jack Russel, Chihuahua) will be more likely to feel cold and would likely benefit from a winter coat. Please make sure that the coat is well-fitted and waterproof. This allows it to effectively retain your dog's body heat. It is also important that the dog has enough room for movement. Always supervise your dog when it is wearing a coat. This will allow you to take action when your dog gets its coat caught on a branch, for example. Many dogs love to play in the snow with their owners. They enthusiastically "bite" the snow and often end up eating some. This shouldn't do any harm, unless your dog eats large amounts of snow. Due to the cold, this can lead to gastrointestinal problems such as nausea, diarrhoea, vomiting and sometimes even gastric torsion. You should therefore provide plenty of distraction when playing in the snow with your dog, and if you cannot prevent your dog eating lots of snow, limit the time you spend outside with him. Also bear in mind that long-haired dogs can get clumps of snow and ice frozen between the pads on their paws. In order to prevent this, you can cut the hair between their toes short before taking your dog out in the snow. Grit can cause burns and irritation on your dog's paw pads. When grit has been spread, it is sensible to avoid these areas as much as possible when walking your dog. If that is not possible, you can rub Vaseline or paw wax onto your dog's paw pads before you go for a walk. This stops some of the grit from attaching to the paw pads. Rinse your dog's paws with lukewarm water after your walk and dry them with a towel. If your dog's paw pads are already irritated or damaged, you will need to put special dog boots on your dog. Dogs are not used to wearing dog shoes and may find them strange at first, but they will get used to them in no time. Please take care and make sure that you keep any antifreeze out of your pets' reach. Antifreeze is highly toxic! Antifreeze contains ethylene glycol and has a sweet flavour. As a result, dogs and cats like to lick it. When an animal ingests this substance, it usually leads to vomiting and neurological symptoms. In time, this will develop into depression, epileptic seizures and kidney failure, resulting in the animal's death in serious cases. If your pet shows these symptoms or if you suspect that your pet has ingested antifreeze, please contact your veterinarian immediately. We are lucky that extreme temperatures are rare in this country. However, do not stay out with your dog too long when it is very cold and your dog is not used to spending long periods of time out in the cold. The longer you spend outside, the more your dog's body temperature will drop, especially if it is not moving. You should never leave a wet dog outside when it is cold. The wet coat doesn't insulate the dog, meaning it will get cold very quickly. Please make sure that your dog cannot walk onto a frozen pond or ditch. The slippery ice can injure dogs' joints, muscles and tendons. What's more, there is a risk of the dog falling through the ice, which could result in hypothermia or drowning. Are you taking your dog with you on your ski trip? In addition to the measures outlined above, it is important that you carefully check what areas your dog will have access to. Make sure that your dog is safe in the car. You can do this by putting the dog in the boot of the car, behind a dog guard. You can also secure your dog using a doggy seat belt. Please note that in Germany, doggy seat belts are compulsory. Smaller dogs can be safely transported through the use of a travel basket. In addition, your dog will have to meet the import requirements of the relevant country when it comes to travel and holidays. You can find a number of different dog coats on our website. Dog winter coats can be made from fleece material and even with nano technology to repel water and unpleasant smell, such as the Dog Gone Smart Nano. Popular dog coats are produced by Ruffwear and Hurtta. Windproof and waterproof dog coat for winter weather. Can be worn in combination with other Ruffwear jackets. Comfortable dog jacket treated with nano technology. Reflective rain and winter coat for small and large dogs.